Cherry and Spoon: Fringe Festival 2016: "The Life of Charles Schulz"
Fringe Festival 2016: "The Life of Charles Schulz"
Summary: The life of St. Paul cartoonist Charles Schulz, creator of Peanuts, arguably the most popular comic strip of all time, as told through a conversation with the man himself. 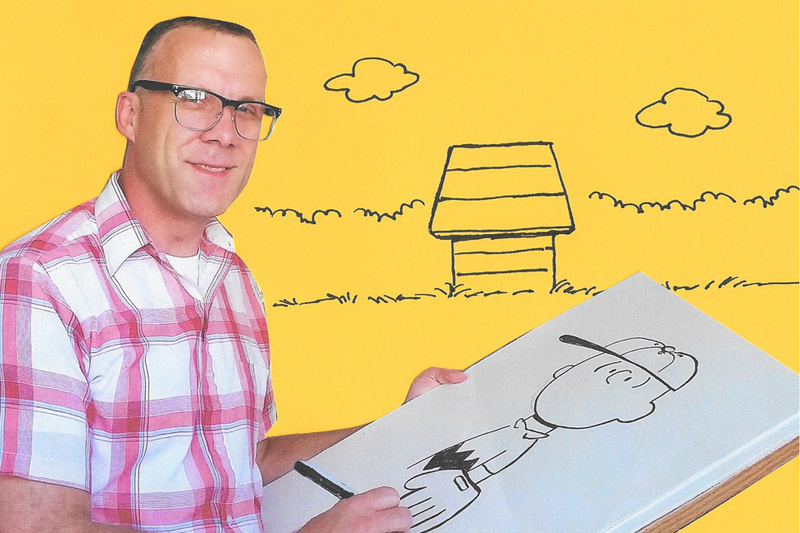 Highlights: Hosted by Patrick O'Brien (see also The Fever), Brad Erickson portrays the unassuming cartoonist as he talks about his life in that humble Minnesota Lutheran sort of way. With a crew cut and glasses straight out of the '50s, Brad becomes Charles Schulz as he tells us about being teased as a child, going off to WWII shortly after the death of his mother, being rejected by the red-headed girl, and his eventual success as a cartoonist and family man. The familiar characters come to life before our eyes as "Sparky" draws with a black marker on an easel sketchpad. This is a refreshingly low-tech show (a second easel holds blown-up photos on large pieces of cardboard), and a sweet and simple story that pulls at the heartstrings and taps into that nostalgia for childhood. Anyone who has ever seen the iconic TV special A Charlie Brown Christmas, or read the comic strip, or seen the movies, or enjoyed the musical You're A Good Man Charlie Brown (and let's face it, is there anyone on this planet who hasn't?) will likely enjoy getting to know the quiet, kind, humble, unassuming, regular guy behind it all. Brad performs this show at schools and ends with a Q&A session, which he does here as well, answering questions about Charles Schulz and Peanuts and giving the audience a chance to share their memories and love for Charlie Brown and friends.